First Read's Morning Clips: Can Kris Kobach win? MIDTERM MADNESS: Can Kris Kobach win? Four women could be their states’ first female governors. The New York Times takes a look. The Washington Post reports on gubernatorial candidates who are pushing for state-based universal health care. 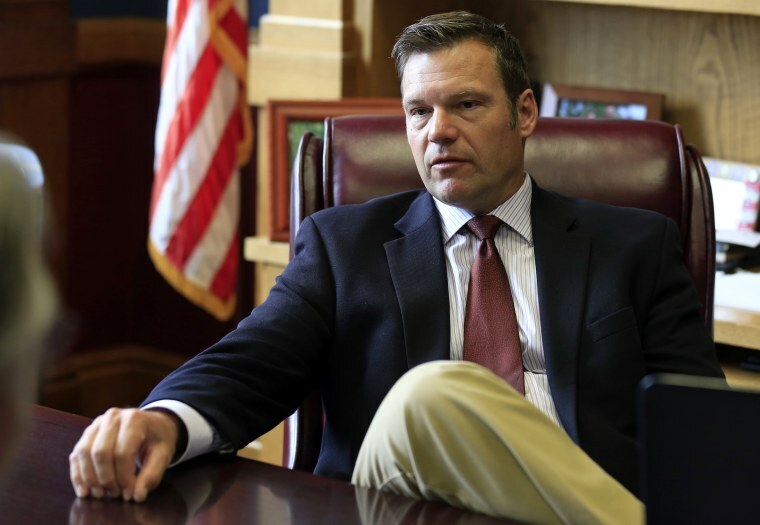 KS-GOV: Can Kris Kobach win? NPR reports. MI-GOV: Progressive icons are trying to elect the country’s first Muslim governor. MN-GOV: Tim Pawlenty and Jeff Johnson argued over past insults of Donald Trump in their first public debate. NJ-SEN: The New York Times writes: Don’t sleep on the New Jersey Senate race. OH-12: Troy Balderson isn’t responding to John Kasich’s claim that he didn’t invite Trump to campaign for him in Ohio. The New York Times takes a 30,000 foot view at what the race in Ohio means. POLITICO writes that O’Connor is surging. VA-SEN: Tim Kaine is up with his first ad. The New York Times writes on how Corey Stewart has kept his white nationalist fans close. Rick Gates is about to take the stand in the Manafort trial. The Manafort trial is heading at a brisk pace for prosecutors. The fight over documents is heating up the Kavanaugh confirmation fight, writes Leigh Ann Caldwell. Businesses dependent on foreign seasonal workers are struggling in the age of Trump.